As soon as they approached the raft, they were attacked by two giant crocodiles. Lee stabbed the one nearest him with Talon, and Pippin leaped onto its back, stabbing it from above with Yig and Yag. Turenim attacked with his spirit guardians and spiritual weapon. It tried to swim under the raft, but Pippin stabbed it in the head, killing it, and used his shortsword to pole-vault onto the raft. Moula battered the other, which was approaching Atilius. Atilius hit it with a fire bolt. Albrecht used hex and stabbed it with his rapier. The crocodile snapped at Atilius with its large maw, and smashed its tail into the raft. Lee, Pippin, and Moula were soon there, and finished it off. They secured the raft and Turenim bandaged everyone's wounds. Then they decided to go through the double doors to the right, and leave the double doors to the left webbed until the spell ran out. Moriarty opened the doors into a ten foot wide corridor extending over 70 feet to the left. Torch light illuminated the far end leaving much of the hall in dim light. Scattered along the hall in small niches were old dwarven statues in various stages of decay. A couple had collapsed and tumbled partially into the hall. At the far end was a twenty foot square room with several kuo-toa sitting around a table. The looked up at the light source, startled. Moriarty cast fire bolt from Fiendburn, knocking one of the kuo-toa off its chair. Lee dashed down the corridor. The statue to the right collapsed onto him, but he continued. Further down, the statues on both sides of him collapsed into the corridor, crushing him. Albrecht cast hex and Eldritch blast on a kuo-toa down the hall. Turenim cast life transference on Lee. As the kuo-toa approached, Moula dashed passed Lee and bashed one of them with her staff. Pippin and Moriarty ran up to stand by Lee's side. Three kuo-toa threw their nets at Moula, two of them getting tangled on each other, and the third missing. Two other kuo-toa stabbed Moula with their spears. Atilius cast scorching ray at two of the kuo-toa. Lee dropped two of the kuo-toa with Talon. Albrecht, casting hex and Eldritch blast, dropped two more. Moula bashed another, and Pippin finished it, driving Yig up into its fish-shaped skull. Moriarty and Albrecht ran towards the room, and the last statue on the right tumbled onto them. Moriarty dove out of the way, but Albrecht was smashed with the falling stone. Albrecht cast healing word on himself. As Pippin started searching through the bodies, making sure they were dead, and gathering any valuables, a kuo-toa jumped out from behind the far corner and smashed Moula twice with a spiked club. Moula retaliated and Albrecht hit it with hex and Eldritch blast. The kuo-toa brute hit Moula again before Lee slashed deep into it with Talon and Turenim finished it with his spirit guardians. Lee and Turenim investigated the fallen statues and found that they were rigged with wires. Pippin killed the kuo-toa that had been knocked off its chair by Moriarty's earlier blast and finished collecting their valuables. Around the corner of the guard room were double doors. Moriarty opened them and they proceeded into a ten foot wide, eighty foot long hall that ended in another set of double doors. Fifty feet down the hall were ten foot wide intersection to the left and right. A sputtering torch provided dim light in the intersection, leaving the rest of the corridor in near darkness. Only twenty-five down the hall was a partially open door on the left. Ten feet further was a closed door on the right. They heard sounds coming from the slightly ajar door. Listening closer they heard kuo-toa speaking and what sounded like a beast eating and something groaning in agony. 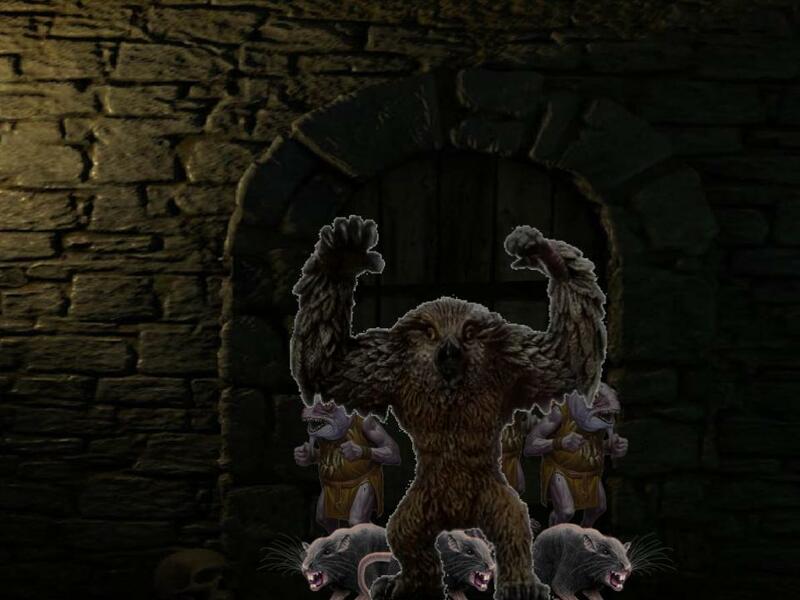 They peeked into the open door and saw a twenty by twenty-five foot room with four kuo-toa standing around a grey-skinned dwarf that appeared to be torturing a prone man with a pack of giant rats. In the corner, three owlbears were eating slop from the floor. Lee stood back and instructed everyone to create a choke point around the door. Moula followed suit. Albrecht moved into the room and blasted the dwarf with hex and Eldritch blast, dropping it. Turenim entered the room and used preserve life on the prone prisoner, Moula, Albrecht, and himself. The kuo-toa commanded the owlbears to attack, and one of them mauled Albrecht with its claws and beak. Albrecht retaliated with hellish rebuke. Another owlbear mauled Turenim with its claws and beak, dropping the Dawnbringer. The third owlbear went to the doorway and bit Moula. Lee, Moula, and Pippin dropped it with a barrage of blows. The giant rats swarmed around the dead owlbear and onto Pippin, biting him all over until he fell. Atilius crouched down and destroyed all six giant rats with burning hands. Moriarty climbed over the owlbear and swung wildly at the kuo-toa, missing them, but avoiding their spears. Lee pushed his way into the room and stabbed at one of the kuo-toa. Moula bashed the owlbear that was about to dig into Turenim, avoiding its retaliation. Albrecht revived Turenim with healing word, and stabbed his owlbear, which mauled him in return. Turenim rose and cast mass healing word on Moula, Pippin, Moriarty, Albrecht, Atilius, and himself, reviving Pippin. Atilius dropped one of the kuo-toa with a fire bolt. Moriarty used Fiendburn to cast burning hands, dropped the other three kuo-toa. Lee slashed at the owlbear that was attacking Albrecht, who then finished it with his rapier and psychic blast. Moula whacked at the last bloody owlbear, but was raked with its claws in return. Pippin dashed up with his right hand behind his back and said "Don't worry Moula. I got this," and dropped the last owlbear with a vicious attack from Yag. Pippin searched the dead for valuables while Turenim bandaged everyone's wounds, including the prisoner. Revived and refreshed, the young man thanked him and introduced himself as Broward Harpell. He was rather large of girth, but average in height. Atilius asked if he was a member of the Longsaddle Harpell clan. When Broward confirmed he asked "Are you one of Kipper's family? I don't remember seeing you there." Broward explained that he went off to live with an aunt to study magic. They asked how he got there and he explained that he was both a wizard and an engineer and took up with a group of mostly miners to seek work in Wave Echo Cavern. The last thing he remembered was trekking through the Sword Mountains with them. He didn't remember being attacked, and he was surprised to hear that it was only Ches 9, saying that it felt like much longer. He asked if by any chance they had found his spell books, which they admitted they had not. Atilius and Broward briefly conversed about what spell's they were capable of casting. They decided to rest in the prisoner's room. Lee cast alarm and Albrecht cast Leomund's tiny hut. Secure, Albrecht sang a song of rest to help them recuperate. About four hours into their rest they saw three kuo-toa guards enter the room and smack their pincers against the outside of the opaque hut. After a few attempts they left, closing the door. After another four hours the hut disappeared and Albrecht led the way out of the room. He was immediately attacked by four kuo-toa. An archpriest cast hold person on him, but he overcame its effect. One of the kuo-toa grabbed him with its pincers and another stabbed at him. Lee, Moula, and Pippin assaulted the archpriest, ignoring the others. 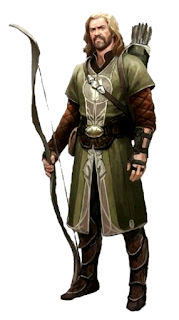 Turenim cast bless on Moula, Atilius, Lee, and himself, and used his spiritual weapon against the archpriest. Broward cast fire bolt at it, but missed. Atilius used scorching ray to finish the archpriest and blast the kuo-toa that was holding Albrecht. The three kuo-toa stabbed in vain at Albrecht and Atilius. Lee dropped the kuo-toa that was holding Albrecht. Moula kicked at the second one, and Pippin stabbed it. Turenim tried to cast spiritual weapon, but fumbled and the spell failed. Broward hit it with a fire bolt, and Atilius missed it. The kuo-toa grabbed Atilius with its pincers and the other stabbed him. With two slashes, Lee dropped the kuo-toa that had been holding Atilius. Moula, Albrecht, and Pippin bombarded the last kuo-toa with strikes. Turenim hit it with Lightbringer, and cast healing word on Atilius. Moriarty finished the last kuo-toa with Fiendburn. Pippin collected their valuables while Turenim bandaged everyone's wounds, and the group continued their exploration. Moriarty opened the door across the hall and they found a twenty by fifteen foot storage room. Exploring the contents, the only thing of value that they found was Broward's studded cane. They continued down the hall to the last door on the right, just before the double doors at the end of the corridor. Moriarty opened the door and they found a small chamber with five alcoves, two on each side and one at the end. In the one at the end they found a tall statue of a dwarf with a cloth draped over its arm. The four on the sides each contained stone seats with holes in the middle. There was nothing else of interest. They went back the way they came and turned left, heading south. After twenty feet the passage narrowed to five feet wide. After another thirty feet it opened up into a thirty foot square chamber, dimly lit with a torch. They saw a set of double doors opposite them and doors exiting the chamber on both sides. Kuo-toa of various sizes were congregated there, playing some sort of game with bones and shells. The chamber was filled with crude clothing and scraps of armor, tools, weapons, and a few old tables with junk and random garbage. Two giant lizards were laying in the corner, and one lifted its head up, appearing to be alerted by their approach. The group backed up into the corridor and discussed their strategy. Turenim wanted to try and confirm whether they were evil. Pippin asked, "Didn't you already determine that they were evil on the landing?" "But we don't know about these kuo-toa." Turenim responded. Ultimately the group agreed that there was no way to confirm they were evil, and Atilius cast fireball into the chamber at Moriarty's urging. Everyone was immediately incinerated except for the two lizards that charged into the corridor and one kuo-toa that followed them. Lee put down the two drakes with two swings of Talon, and Moula put down the last kuo-toa. Entering the scorched chamber they saw it contained another, partially opened door next to their entrance. Moriarty quickly checked inside and saw that it contained two stone seats with holes in the middle. The went through the eastern side door and into another five foot wide corridor. Moriarty opened the first door, on the right wall, and saw a twenty by fifteen foot room with five kuo-toa inside. He immediately used Fiendburn to cast burning hands, incinerating them all. The room appeared to be living quarters. Moriarty opened the second door, on the left wall, and saw a twenty-five by ten foot room with five more kuo-toa inside. At the insistence of Moriarty, Atilius immediately cast burning hands as well, incinerating them all. The room also appeared to be living quarters. Moriarty opened the third door, on the left wall, and saw a wide corridor leading to a larger chamber with rubble at the back, also appearing to be living quarters with five kuo-toa inside. They all entered the room and discussed how to dispose of the kuo-toa. Hearing that Albrecht could cast thunderwave, Moriarty urged him to do it. Turenim voiced his reservations about the wanton killing of these families. Upon reflection the group was conflicted. Turenim cast tongues and declared "We come in peace. We don't want to hurt you. If you come with us, I can't guarantee..." Turenim struggled with how to continue, and everyone chimed in with suggestions. Pippin argued that they would have to kill them anyway, and that anything we promised them would be a lie. "Anyway, they're a bunch of demon worshipers!" Turenim offered to bring them back to a different cave where they would be safe, referring to Cragmaw Hideout, but they said they did not want to leave and that they just wanted to be left alone. They promised not to attack anyone. Moula expressed concern that eventually the miners would come and things would turn violent. Turenim apologized and asked them if they could gather their people together so they could all talk. The group muttered in confusion until Pippin spoke up. "You want to gather them together! And then what are we going to do? Cast fireball on all of them? Cause I'm down for that. Otherwise, we're just asking for them to outnumber us." Moriarty began to speak, but Pippin stopped him, stating, "I'm not talking to you, Moriarty!" "That might come up as a possibility." Turenim offered. "It doesn't seem like it. In this area it seems like most of them are..."
"Yeah, but what happens when we reach some guards?" Pippin challenged. "How many of them have we fought? How many of them have attacked us? And we're going to gather them all together?" "How many more shamans are we going to fight?" Pippin continued. Moula voiced her agreement with Pippin. "Turenim, while I do think..." Moriarty started, but was quickly cutoff. "Shut up, Moriarty!" Pippin demanded. "You're not in this party." "Even though I'm not considered to be in your adventuring group," Moriarty tried again, "I think..."
"Look," Pippin interrupted. "When we need you to cast flaming hands we'll let you know." "We're going to be following them around." Turenim suggested. "If they start to gather their forces..."
"You're asking them to gather their forces!" Pippin rebutted. "Yes." Turenim acknowledge. "If they start to attack us..."
"If they start to attack us we'll already be in a fight!" Moula added. "You know that battle with the shaman on the landing was a pretty close call for some of you!" Pippin warned. "I think we have more to gain than we do to lose by talking to them." Moriarty offered. "I think this is a stupid idea." Moula stated. "I think you should listen to Moula." Pippin added. "She's got the Oghma stone and she is wise." "This is going to be a trap." Atilius fretted. "You're just asking for them to give us trouble." Pippin argued. "You're asking them to gather their forces together. Unless we have a trap ready for them, why would we ask them to do this?" "They saw our hut." Moula offered. "It's a very reasonable assumption that their soldiers already know about us and are waiting to attack us." "We've torn through this place." Turenim tried. "And I know we haven't covered nearly all of it, but our fear of being attacked when we're ripping through them..."
"Moula was nearly kidnapped." Pippin challenged. "I fell three times in that fight." Moula added. The group erupted into an argument with everyone yelling over each other with Moriarty siding with Turenim. "I can't keep doing this anymore." Turenim announced. "I don't want to keep ripping through the heart of this..."
"Why don't you just wait outside?" Pippin asked. "No." Turenim answered. "I can't do that." "They're evil creatures," Pippin argued. "They're monsters!" "They're all evil." Moula agreed. "Some of them are." Turenim answered. "Why don't we just leave them here then." Pippin offered. "But don't tell them to gather all their forces together. Just leave them here and tell them not to leave the room. How about that?" "Okay." Turenim agreed. "And we're going to do this in every room?" The group was soon in agreement. "We're going to go." Turenim told the kuo-toa. "Stay here for now. We'll be back later. I'm sorry about everything." The group left the room, closed the door and entered the last room in the corridor. They saw a twenty by thirty foot room with another family of kuo-toa. Turenim told them to stay put and they headed back to the first room they had scorched. I don’t know what I think of this new Moriarty guy. In the beginning, he seemed quiet yet brave and strong, but now, after we got down into the Kuo-Toa cave he has tried to lead the party around. He’s been running around like the party is just his followers. I don’t know how much I like that. This Broward guy seems like he shouldn’t be coming with us, but Turenim and the rest of the party feverishly desire him to follow us along. Unlike Moriarty, I feel he’ll get himself hurt, and that will force Turenim to waste more of his spells on him until he just doesn’t have enough and the poor guy dies. I wish we would have a better way to send him back towards Gundren or store him in some room, but bringing him around seems like the only option now. Pippin’s been taking charge lately, some of which I’ve been really proud of. The little guy now holds his own since everyone takes him seriously. Hopefully he’s having a good time, and fighting all these demons and demon-worshipping Kuo-Toa will show him how bad it is to act like them. No notes on Albrecht, quiet and weird as always. No notes on Moula, except that she’s now gone against Turenim which is new. No notes on Attilius, I hope the guy gets along with the Broward fellow, seeing they’re both mages and could help each other.